An experimental pulse of water flooded the Colorado River delta of sand and a team paddled the crest to see if they could be the first to navigate this forgotten delta and once again kiss the sea. The Colorado River ran to the Sea for six million years but stopped nearly two decades ago. In the spring of 2014, something changed. 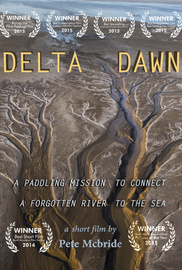 An experimental pulse of water flooded this river of sand and a team paddled the crest to see if they could be the first to navigate this forgotten delta and once again kiss the sea. Winner of Best Short Mountain Film at the 2014 Banff Mountain Film Festival. Additional footage: Andrew Quinn, Owen Bissel, Ron Chapple, Kontent Films.